When it came to comprehensive protection in battle, knights often relied on chainmail to help withstand an enemys blows. The Alaric Chainmail Hauberk provides coverage from torso to thigh as well as the entire length of the arms. Made of mild steel, each butted ring of its construction is interlocked with four others, creating a 4-in-1 design. The armpits have been reinforced with riveted rings to help withstand the stress of movement. 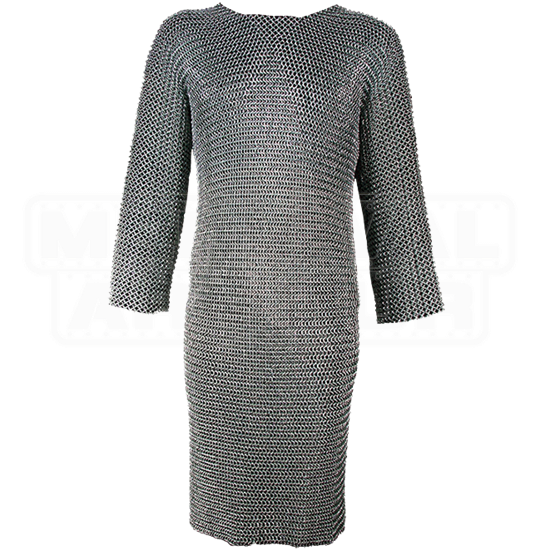 Wear the Alaric Chainmail Hauberk with a gambeson underneath for an authentic and comfortable look during your next LARP or medieval reenactment event. Due to this items handcrafted nature, there may be slight variations to its appearance. Good quality, fast reasonable shipping, yet not 100% historically accurate. If you're looking to reenact any kind of European warrior, then the configuration of this armor won't be completely accurate. Europeans used riveted chainmail, not butted as this piece is. 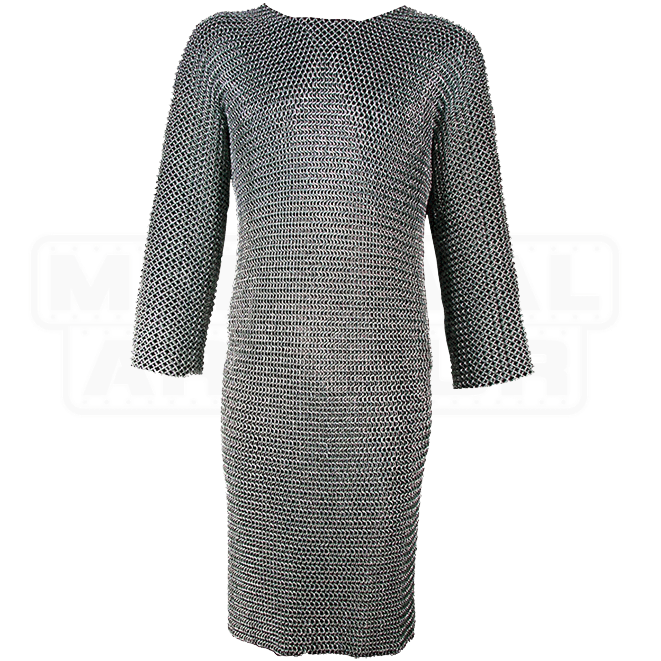 Even still, for the price of this hauberk you can't beat the quality and form of this chainmail. It's roughly 25-30 lbs which doesn't sit too heavy on the shoulders. The fit of this hauberk, as it is measured for one's body, is a good fit. Note, however, that the arms of this mail are not tapered, which most European chainmail was. Also, if you're looking to buy any chainmail, make sure you measure your body AFTER you adorn your undergarments (arming pads, gambesons, under-tunics, etc) otherwise the chainmail may fit much tighter than it should, or not even fit at all. Overall, however, I was pleased with this piece and the speed and affordability it was ordered and shipped.